it's really quite simple: as a participant, you will be asked to choose at least three objects (i don't think anyone would mind if you decide to send more) that are some of YOUR favorite things to send to your partner... maybe it's an apron you made, your new favorite book, or that favorite flavor of lip gloss. be creative & most importantly have fun with it! objects can be new or vintage, bought or handmade... just remember, it is probably best to send something the you'd be pleased to receive yourself. ready to join the fun? please e-mail your particulars to accordingtokelly@gmail.com. sign-ups will be open until friday, june 8th... so get your friends involved! swap partners will be emailed to you shortly after the sign-up deadline. 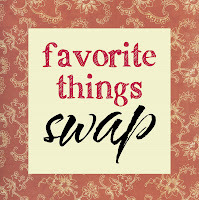 the delivery date for this swap is Monday, June 25... please have it postmarked by then. Preheat oven & bake crust according to the directions. Meanwhile, make haupia: Whisk coconut milk, milk and sugar together in a small saucepan. In a separate bowl, dissolve cornstarch in water. Bring coconut milk mixture to a boil, then reduce to a simmer and whisk in cornstarch mixture, whisking until thickened. Microwave chocolate pieces on high 1 minute; stir to melt completely. Pour half the haupia into a bowl. Mix remaining haupia with melted chocolate and pour over the bottom of the baked pie crust. Layer white haupia over the top. Cool pie at least 1 hour in refrigerator. Whip cream with 1/4 cup sugar until still peaks form. Garnish pie with whipped cream and shaved chocolate. Chill another hour. Serves 6 to 8. I know this isn't news to anyone, but I am always amazed at how fast they grow. I can't believe Owen is already 7 months old. He still seems so little, and yet, everyday I am reminded about how big he is. He isn't really a "baby" anymore. 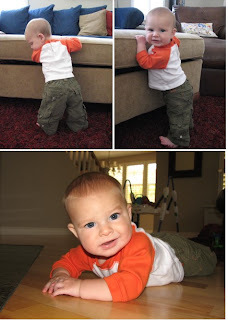 He is sitting up on his own, doing the army crawl & even standing against the furniture! I don't know if I am prepared for him to grow up this fast! Had to finish these up for a baby shower. Girls are so foreign to me... I think I went a little crazy with the pink! Is it too much? I stole these from my mom's house, sorry mom! Anyway, i just can't stop eating them. They are so minty cool... thought you'd like to know. I wonder if I could create a yummy dessert out of them? There are probably a billion recipes already out there, maybe I'll do a little internet search. Do you know of any recipes involving Andes Mints? watch out world! here comes owen. 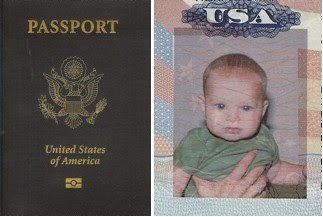 Owen's passport just arrived! Yeah! Now he can travel the world. He looks really excited in his picture, doesn't he? Gavin has always talked a lot... although, for a long time you could never really understand much of what he was saying. These days though, he is making more & more sense. Yet you can imagine my surprise, when he suddenly blurted out a word that sounded very similar to an ugly little word starting with the letter "F". We were shopping in Nordstrom's, when Gavin starts going crazy & shouting this word, over and over again. Suddenly streams of thoughts go through my mind: What in the world? What is he saying? It can't be... But where would he have heard it? I hate that word, Jeff doesn't say. TV? No. Movies? No. Okay, so if it's not that word, what is he saying? By now I am frantically looking around. Is their something here? Does he see something? And then I spot it... on the bottom shelf, about 5 feet away is a package of FROGS. Very quickly, and very loudly (so that everyone in the entire store can hear) I say " Oh, FROGS. You see the FROGS. Yep Gavin, there are some FROGS over there." I just wanted to report that I made the cafe rio salad last week, and boy was it delicious! The recipes aren't mine... they come from the friend of a friend of a friend. But they are definitely something you should try at home... but be warned, it makes a ton of food, so invite your nearest and dearest over & have a party! Once you've made the dressing, pork, rice & beans, it's almost time to eat. But you still have to assemble the salad. 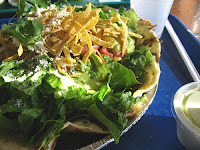 Start with a tortilla (we used the disposable aluminum pie tins, but you could use a bowl), then layer on cooked beans, rice, romaine lettuce, pork, dressing, and any of your favorite toppings: pico de gallo, guacamole, tortilla strips, cheese, cilantro & lime. i can always count on urban! It's hard to walk into Urban Outfitters, without buying anything.The stores are absolutely HUGE & have tons of selection. If you look long enough, your bound to come across something you just "gotta have." On my most recent outing, I picked up a few things I never knew I needed... I'm so excited about this jacket, I've already worn it several times! I love the detail of the rick rack on the edging! I got in this yellow & brown combo, but it also comes in olive green with lime rick rack - too very cute. I had a VERY HARD time deciding which color to go with. Then I came across this hat. I LOVE hats, so it was given that I would be picking this one up. But let me tell you, it is my new favorite accessory, I wish I could wear it every day... it makes me feel, I don't know, "free." Last but not least, a pair of dang cute shorts. Actually two pairs of dang cute shorts, I got them in the brown and blue & the red and brown! Anyway, I can't wait to wear my new duds. I don't think these pictures do justice to just how cute it all is. 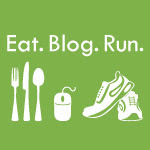 they mimic barefoot running, which is supposed to make you stronger. So, I was pretty excited when I saw their new "mary jane" version. After spending the day in my new shoes, I have nothing but good things to saw. I think I need another pair or two... I'm thinking tango & icy blue. For christmas my brother got the new Guitar Hero game (check out his video here.) It quickly became Gavin's favorite... gavin loves to watch everyone play, while he sits close by pretending to also play. & if you're lucky he'll start to dance and sing along (his favorite tune is motley crue's shout at the devil... he loves to yell "shout! shout!) anyway, my mom got gavin his own guitar to rock with! 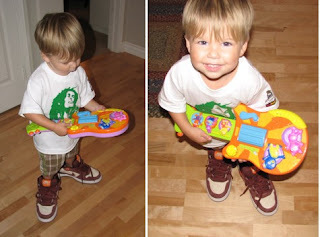 He was rocking out this weekend while appropriately wearing his bob marley t-shirt. Sometimes I wish I were more childlike... i love how kids are able to find joy and happiness in everything. Playing in the back seat of the rental car made Gavin's day! "every year over one million Kitchen Aid mxers are sold and not a single one with flames! Only you can put a stop to this tragedy. By making a small, non-taxdeductable donation through this PURCHASE link we can start the healing process one mixer at a time. Flame it up! 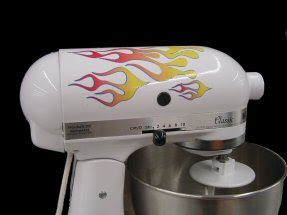 Hot Rod your kitchen mixer in an instant by adding these custom designed Flame Decals! It will soon get tons of attention like your mixer should!" I absolutely LOVE pictures, who doesn't? But I especially adore pictures of my boys. And although I'd like to consider myself an amateur photographer (I have over 8,000 pictures in my iPhoto Library), I'm the first to admit that photography isn't as simple as point & shoot... there is definitely some talent involved. Unfortunately, taking "beautiful" pictures isn't exactly my strong suit... lucky for me, I found Ana Brandt. Not only does she take amazing pictures, but she is also incredibly creative. She just posted these new pictures she took of my boys to her new blog, so I thought I'd share them too. Both boys were asleep at the exact same time today. That's what I call a miracle. Although I have plenty of other things to do: cook, clean, laundry, actual work for the job I get paid to do... I found myself sitting at the sewing machine, whipping up a few baby presents. I thought this little set turned out cute. A baby blanket with matching burp rag & onesie. I've made similar blankets for my boys & just love them. I don't know what it is... the color, the textures, the array of fabrics? They are just fun. The burp rag was a last minute addition, & I got the idea for the onesie from a post by Leslie a while back. I'm not sure who I'm sending it too yet, I just hope they enjoy it as much as I did making it! i swear, i turned my back for just a second! Whenever the girls in our family get together, we get crafty. so lucky to be surrounded by so many incredibly talented & creative people. I am often find myself both inspired and jealous of their natural ability to make & create beautiful and fun things. Anyway... on a recent trip we found ourselves I am inside a craft store, suddenly inspired by the array of blank canvas. So, we bought a couple and got to work. Using paint, scrap book paper, needle & thread we created some fun pieces of "art" that was both fun and easy! Go pick up a canvas, and create something today! my mom gets every catalog in the entire world, i think. On a recent visit I was perusing her stack and I came across a catalog that was new to me... Chasing Fireflies. 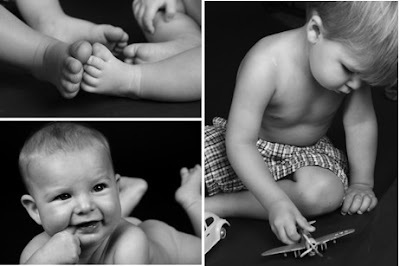 Lots of cute, fun & magical things to delight both you and your children. 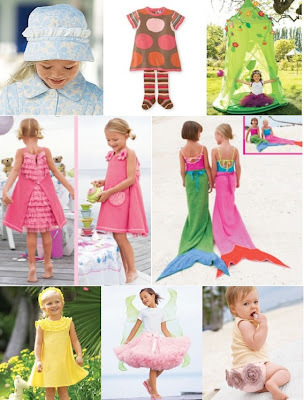 I was particularly drawn to all things girly... here are some of my favorites. Too bad I don't have a little girl to buy them for. can you afford to be "green"? Consuelo Castiglioni of Marni. 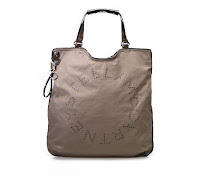 $843 for a nylon bag... what a steal! Still haven't seen anything that tickles your fancy? Well, if you can hold out until later this summer, the one & only Hermes will be introducing their own version of the reusable grocery sack... made of hand-wrought silk, it collapses into a wallet-size pouch of calfskin. At just $960 it's a must-have for every grocery shopper. 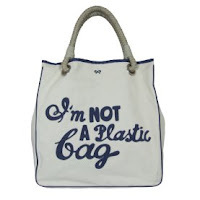 Or, perhaps you might be interested in Anya Hinmarch's "I'm not a plastic bag" available here in the US, on a pre-order basis, in June. At $15 a piece, this might be more up your alley. 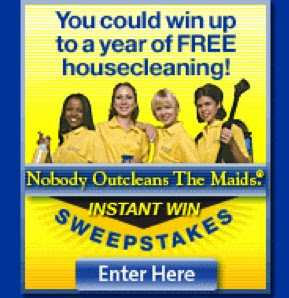 The problem will be getting one! They are sold out everywhere. I've heard they're even selling on ebay for 10x the original price! So here's the thing... I don't know about you, but when I go to the grocery store, I don't leave with just one bag. I leave with like 10 or 15. So, is this truly feasible? Honestly?! Even if I bought the Trader Joe's specials for a buck 99, it could definitely get expensive. Then, where would you store them all? I might have think some more about this one. Owen turned 6 months on April 27th! It's crazy how fast they change. The day before he turned 6 months, he could sit for a brief moment before wobbling, and toppling over. The next day though, on the 6 month mark, it was like "no problem." He acted like he'd been sitting his entire life. Suddenly he could go for minutes before falling over. Everyday, I can't believe how fast time flies! Where has the last 6 months gone? because you can go to Disneyland for dinner, fireworks, a few rides... what a great way to spend a Saturday evening! wouldn't it be cute "in a room somewhere, far away from the cold night air"? Maybe in a little girls bedroom? 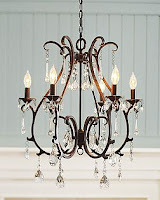 Kerry, weren't you looking for a chandelier for your college apartment? This could do! This past Monday was our family's annual golf tournament, the TKM Memorial, which raises money for the John Wayne Cancer Institute. Each year shopping for snacks is like taking a shot in the dark... you never know if the players will be on a healthy kick or junk food binge. This year the junk food must have won out because there were lots and lots of left over apples. 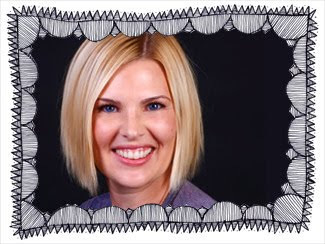 Luckily, our friend Taryn, remembered a favorite family recipe... boy was it delicious! 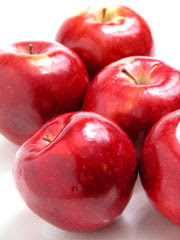 Top apples with sugar mixture, and bake at 375 for 50-60 minutes. Top with whipped cream &/or vanilla ice cream. Just got the new Neiman Marcus catalog, and there are LOTS of good things inside! I seem to have a "thing" for dresses lately. Although... I did see a girl wearing the eyelet shirt (top right corner) and it was VERY VERY cute in person! And who can say "no" to polka dots? 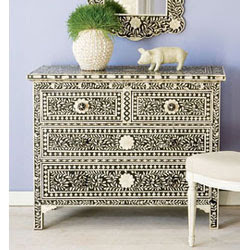 I really, really want this chest of drawers (you can buy it HERE). But what I really want is to have created, and thought up the company/ catalog that sells it.... Wisteria. Wanting beautiful, interesting things to furnish their home, but not wanting to spend twenty years collecting, Wisteria's founders spent a few years searching the world. The got to see the world, they found their treasures, and they paid for it buy bringing some things back home to sell. Now that's the life... traveling, shopping & getting paid for it! "Mama Stone Vintage has by far my favorite collection of vintage clothing that I've even seen- they are the reason why we love vintage so much, they find the original goods that Free People and Anthropologie mimic in their designs." 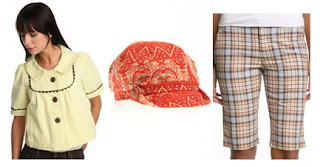 If you love the likes of Urban Outfitters or Anthro, then you'll want to check out the Mama Stone Vintage ebay store. No one can ever say I'm not a natural blonde. Today I had yet another blonde moment... my car is in the shop. Actually, it went into the shop last Friday, for a repair that was supposed to take a day. Long story short, it is still in the shop, and probably will be until at least Wednesday. Anyway, I have been up at my mom's and was just getting home. Exhausted from driving in California traffic, I pulled into the driveway. When suddenly it hits me - I don't have any house keys. On top of that, my cell phone just died. Lucky for me I have nice neighbors who let me borrow their phone to call Jeff. Not so luckily, his cell was also dead (aren't we a pair?). I never got a hold of him, so the boys and I just hung around outside for awhile before our neighbors took pity on us and invited us in. Thank goodness Jeff didn't work too late & we weren't stranded for much longer than an hour. The sad part... this isn't the first time I've been locked out. You'd think I'd learn my lesson, or at least hide a key! I hope you had a wonderful day... we missed being able to celebrate with you! this is my wish for you: comfort on difficult days, smiles when sadness intrudes, rainbows to follow the clouds, laughter to kiss your lips, sunsets to warm your heart, hugs when spirits sag, beauty for your eyes to see, friendships to brighten your being, faith so that you can believe, confidence for when you are in doubt, courage to know yourself, patience to accept the truth, love to complete your life.